Pain is often misunderstood, undiagnosed and untreated, especially in children. Reasons may include difficulties in assessing severity, with children not appearing to be distressed or having difficulty communicating their pain. The guidance includes a number of recommendations, including that recognising and alleviating pain in ill or injured children should be a priority. This process should start at triage and be monitored throughout each child’s time in an emergency department (ED). It should end by ensuring adequate analgesia is provided at, and where appropriate beyond, discharge. The guidance says healthcare professionals caring for children should also pay attention to factors that may be distressing them, including unfamiliar environments and people, parental distress and fear relating to the severity of injury. The RCEM says it is essential that all staff involved in patient care should be trained in pain relief for children to ensure quality and timely management. 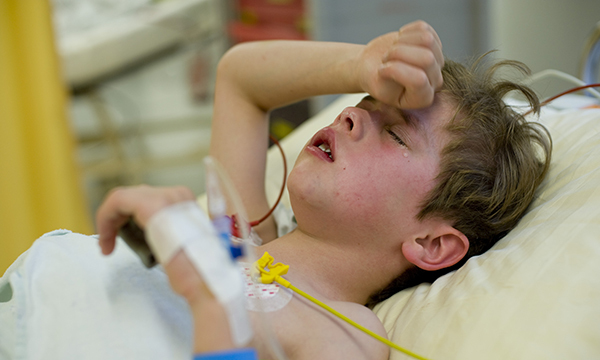 The RCEM guidance includes a tool for assessing acute pain in children in the ED. The tool allocates children to one of four pain categories: no pain, and mild, moderate or severe pain. To help assessment, the tool uses faces ranging from happy to crying, with associated behaviour and examples of injuries, from a bump on the head to appendicitis. Be vigilant for any indication of pain. Listen carefully for a child’s reports of pain and behavioural clues, including facial expressions, limb movements, body posture, crying, verbalisation, restlessness, undue quietness and guarding pressure on a painful area. Parents may be able to help you understand the language their children use to describe their symptoms and pain. But keep in mind that, although often helpful, parents’ views may be distorted by their understandable concerns about their child’s suffering.